One of Europe's most historic capitals, Lisbon, Portugal, is a popular draw among tourists and golfers alike. Far from the Algarve Region in the south of Portugal, Lisbon's surroundings offers similar quality golf and beaches, but add an urban flair. There's plenty to do off the golf course in Lisbon, and the locals make sure you get a good meal and fine wine. GolfEurope.com has Lisbon covered from all angles, with travel information, features, reviews of golf courses, podcasts, photos and off-course ideas in this special destination guide. Lisbon's golf coast is far from the Algarve and offers plenty of culture and things to do. 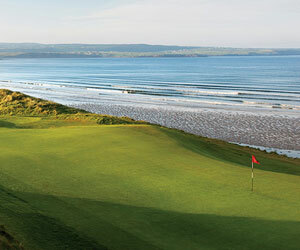 The beautiful coastal courses are no slouch either. Oitavos Golf Club: Home of the European Tour's Portuguese Open and sight of Barry Lane's infamous nine. Praia D'El Rey Golf and Beach Resort: A beautiful coastal course, but too much construction looms. Estoril Golf Club: Classic European golf in the home of James Bond. Brandon Tucker blogs during his golf trip to Lisbon. Is the 18th at Oitavos really harder than Carnoustie's famous closer? Dinner in Portugal may last longer than 18 holes, not that Tucker is complaining. Tucker found Praia D'el Rey to be a beautiful coastal course, but construction around the course is taking away some of the allure.